I love mornings. I love friendships. I love friendships that develop over the course of one year, in the morning, through the lens of two cameras. Consequently, I love the circumstances that created this book. 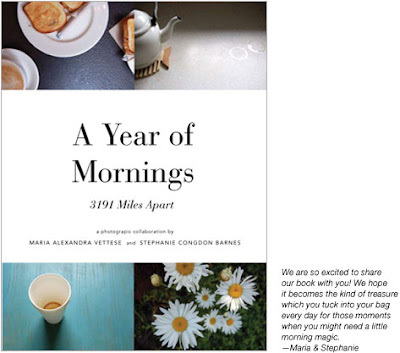 From the website, "3191, A Year of Mornings began on January 1, 2007 as an almost daily photo conversation, in blog form, between two friends that live 3191 miles apart. It lasted the entire calendar year ending on December 31, 2007 and was followed by 3191, A Year of Evenings which ended on January 15, 2009." Both blogs have since been turned into books; A Year of Mornings, published in Fall 2008, and A Year of Evenings, published in Summer 2009. Oh, and if you crave some (online) inspiration, check out the duo's current project, 3191 Miles Apart. Does anyone own these treasures? I have yet to pick up copies of each book for myself, but I want to--desperately--as I yearn to begin my own daily photo documentation of life's nibbles and bits.